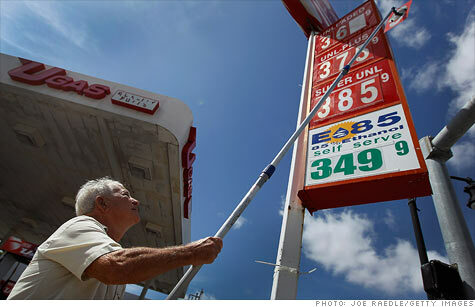 The average price for a gallon of gas nationwide is $3.835, according to AAA. That is just 7% below the all-time high. NEW YORK (CNNMoney) -- The national average price for a gallon of gasoline rose for the eighth straight day on Saturday to $3.835. That is now only about 7% below the record high of $4.11 from July 2008. The average price rose by four-tenths of a penny, according to the survey of gas stations conducted for the motorist group AAA. Gas prices are now up more than 17% this year. The nationwide average was $3.52 a gallon a month ago and $3.76 a gallon on March 9 -- the day that prices started rising again after a few days of slight declines. Wyoming has the nation's lowest gas prices, averaging slightly above $3.40 a gallon. Gas prices have been rising on the back of soaring oil prices, which have shot up more than 5% over the past month amid fears that tensions with Iran will lead to an all-out war that causes a disruption in oil supplies. The spike in gas prices has led to speculation that the U.S. and Britain may release strategic oil reserves over the next few months in order to boost supplies and lower crude prices. The White House denied a Reuters report about this Thursday. Signs of an improving economy have also boosted oil prices, as has the stock market, which hit multi-year highs this week.